The official bellaknitting.com blog. See Laura and Sarah perform death-defying stunts of knittitude! Watch as they daringly photograph crafts-in-progress! Marvel as they tame wild and dangerous skeins of yarn! Have you tried Tunisian knitting (aka Shepherd's knitting, Scottish knitting, Irish crochet, Hook knitting, Tunisian crochet, or Afghan stitch) yet? We're adding some new Bella collections soon which use this cool technique. I got a serious case of project envy when I hung out with my friend Tracy, who is test-knitting (well, Tunisian knitting) something for the new collection, and so I just had to try it myself. This is the beginning of a new Bella design, a three-color pillow cover in Tunisian knitting. I'll be blogging about it now and then as it takes shape. I chose this color combo because these are some of the colors I'm going to use to decorate the little dude's room -- I think the rich deep blue is a little more interesting than the typical baby blue, and it pairs really nicely with a varitety of neutrals. The other nice thing about using a color combo which doesn't shout "baby!" is versatility -- this pillow would fit in anywhere in my house, and both the right and the wrong side are really pretty. 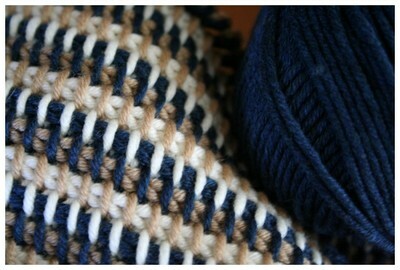 The "wrong side," in the photo to the right, looks a lot like reverse stockinette. 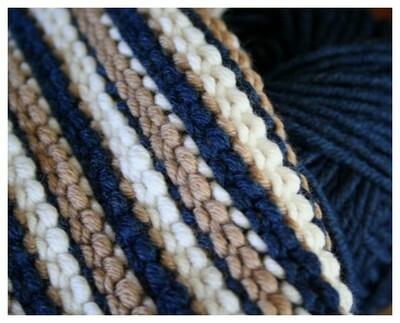 Now I'm thinking how cute it would be to do a Tunisian knitted pillow using several very different yarn textures, all in the same color range...What do you think? Reblog (0) | | Digg This | Tweet This! that's a spectacular color combo and that knitting style produces such a lovely sturdy effect. Can't wait to see more.